When a paramedic student learns to use a transcutaneous pacer, they are taught the indications of pacemaker use, premedicating the patient, attaching and activating the pacer, confirming electrical and mechanical capture, and so on. They aren’t taught the last step, which is just as important. Defend your patient from the attack of the ED staff. Please allow me to explain. At the beginning of my career, I responded to an elderly female who had a syncopal event in the shower. I didn’t think she hurt herself, but the exam was hindered by her mental status. You see, she had advanced Alzheimer’s disease and hadn’t really expressed a rational thought in several years. Her husband was her primary caretaker, had witnessed the event, and assisted her off of the little stool that people with Alzheimer’s sit on while they shower. So that is why I was pretty sure she hadn’t injured herself. But it did leave the syncope for me to figure out. She was tachycardic and irregular, but appeared to have a sinus rhythm when things slowed down a little. 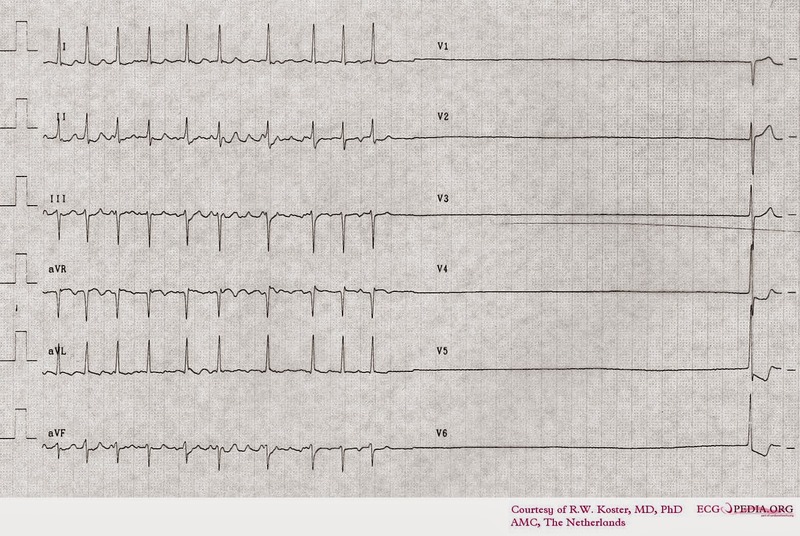 Maybe AFib or atrial flutter. There seemed to be a little bit of everything. Whatever was going on, her blood pressure was normal and she had no apparent breathing problems. I loaded her into the ambulance and began to transport her to the hospital. While enroute, the lady’s heart rate became very unstable, with a run of extreme tachycardia, periods of bradycardia, sinus pauses, another pop of narrow complex tach, and so on. I was new and didn’t really know how to describe all of the different arrhythmias that flashed across the screen in about a minute and a half. Now I know it was probably sick sinus syndrome. Her heart rate and rhythm finally stabilized. Unfortunately, it stabilized on sinus bradycardia with a rate of 30. No distal pacemaker escaped. The patient became unresponsive and her blood pressure fell to 70 palpated. The bradycardia remained throughout the rest of the call. A milligram of atropine had no effect and I got on the horn to medical control. (Back then, we had to call for pacing and for benzodiazepines. I think. I may have been being an overly cautious new medic, but I think the phone call was required.) The resident who answered the phone approved the pacing plan, but denied Valium. His concern was that her pressure was too low and the benzo would drop it further. My efforts at pointing out that the pacer was about to fix the hypotension problem had no effect. Okay, so this lady was about to get paced without sedation. I turned on the pacer and the lady, this nice woman with a husband that loved her enough to care for her at home, who raised a family and probably never missed church and volunteering at school functions, she began to twitch at each the pacer impulses. He mentation improved over the course of 10 or 15 beats, as well. I knew that she woke up because she began to bellow profanities, louder and louder at each twitch. Bellowed. At the top of her lungs. That’s right, eighty times a minute this sweet Alzheimer’s patient hollered the most vile curses at me that I have ever heard. And they made sense, like in an insulting sort of way. Not Alzheimery cursing, but oaths and threats that had an underlying theme, cadence, characters, drama, and background story. I rolled her into the emergency department as quickly as I could – I really wanted to get her some sedation. We got to the assigned room and I started to give my report. I wanted to give it quickly so that some meds could get into her. The ED staff did what they normally do. 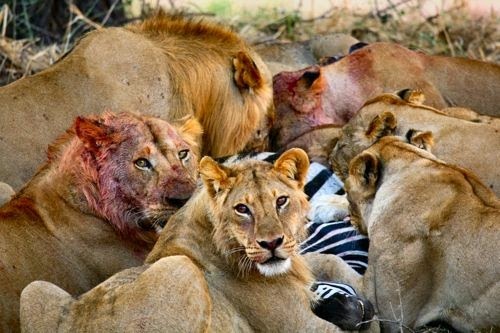 That is, they looked amazingly like a herd of lions feeding on a zebra – just someone’s legs sticking out of the pride of nurses. They moved her from my pram to the hospital bed, confirmed the IV’s patency, and disconnected my monitor. Usually nurses don't get their faces this bloody, but you get the general point. The patient went abruptly silent. Which was a relief, after the obscenities she was tossing out with wild abandon. Oh, wait. No it wasn’t. It was a bad thing that she fell unconscious again. The ED’s pacer wasn’t ready. It’s not clear it was even in the room. This happens every time I bring a paced patient to the ED. I think what happens is that ED staffers are used to disconnecting our monitors. We bring a lot of patients to them with 12-leads across their chest and the staff’s priority is to get that off so they can get theirs on. They are trying to help and firing on all cylinders. But they aren’t used to pacemakers going. So sometimes they get pulled a bit prematurely. Defend your patient from the ED. Every hospital does it. No matter how good or bad my biophone report is, it happens. Every single time. * Make sure nothing gets disconnected until everyone is ready to reconnect. That may even mean physically stopping techs and nurses from touching the patient and your monitor. Defend your patient. Give the ED staff time to prepare their equipment, check the IV lines, and get whatever medication they may need. Show the physician that our monitors have a pause button that temporarily stops the pacer so the underlying rhythm is visible. Let him or her see that rhythm. There is a difference between hurrying and rushing. Defend your patient. Once everything is reported, understood, planned, prepped, and ready, then transfer the patient and disconnect your pacer. *Admittedly, it probably isn’t every single time. I admit there is probably some confirmation bias in my memories. But it happens a lot.